If you are a germaphobe like me, you are going to absolutely love this story. Whenever I have to fly the first thing I usually think about is how many germs there is going to be on the plane. I think about all the disgusting things people who have sat in the seat, that I am going to be sitting in, have done and I start to feel nauseous. Well…….Seat Sitters has come to save the day. 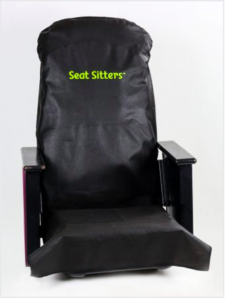 Seat Sitters™ – makes lightweight, 100% recyclable and reusable seat covers for all your travels! With a generous fit for versatility and comfort, this ideal travel companion helps you stay healthy and enjoy your seat. 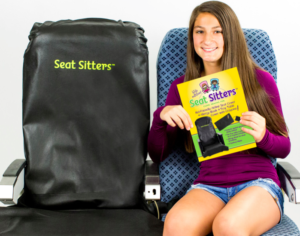 Complete with wipes for the armrests, tray tables and a tray table cover, make your trip a healthy one with Seat Sitters! It is not fun to think about, but the amount of germs on airplane tray tables, seats and arm rests is shocking! On average, over 8 million people fly every day and the FAA does not regulate the cleaning of planes. What?!? Yes, many planes are cleaned only once every 30 days with germs, MRSA and E. coli living up to a week on these surfaces. With this being said, if you travel a lot, invest in a Seat Sitters. From November 20th through the end of December, shoppers can choose from more than 150 (RED) products including fashion, cosmetics, kitchen goods, tech and more at Amazon.com/RED or via the Amazon App. On December 1st, World AIDS Day, Amazon will highlight (RED), the Global Fund, and (RED) products to bring awareness to the fight, and throughout the campaign special video content from (RED) celebrity supporters will encourage people to shop (RED) and save lives this holiday season. Sharing smart ways to shop and give back, stars including Neil Patrick Harris, Tyra Banks, DJ Khaled, Ricardo Kaka, Allison Williams, Javier Munoz, Jay Ellis, Yvonne Orji and supermodel Anne V highlight their favorite (RED) product picks, available on Amazon.com/RED. To underline the impact shoppers can have by choosing (RED) products this holiday, Allison Williams, Jay Ellis and Yvonne Orji came together with (RED) in Africa to visit (RED) supported programs on the ground. You can see and share this short video here. As the Official Payment Provider of (SHOPATHON)RED, long-standing (RED) partner Bank of America is making every dollar spent go even further. 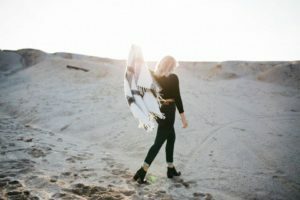 For every dollar spent on Amazon.com/RED from November 20 until December 31, Bank of America will donate 30 cents – the daily cost of life-saving HIV/AIDS medication in sub-Saharan Africa – up to $1.5 million. Every (RED) purchase made by shoppers this holiday will have real impact. The life-saving ARV pills, when taken daily, save not only the life of mothers living with HIV; they also prevent the virus being passed to their unborn babies. As well as providing medication, (RED) money to the Global Fund also supports prevention, testing, counseling and care services programs – all key pillars of the fight to end a disease which is preventable and treatable; a disease which needlessly sees an adolescent become infected every two minutes.